(Insidethegames, Monday, 12 September 2016) World Baseball Softball Confederation (WBSC) Women’s Baseball World Cup champions Japan have had two players named in the All-World Team following the conclusion of the event in South Korea. The Japanese eased to their fifth consecutive title by beating Canada 10-0 in the final in Gijang yesterday. Such is Japan's dominance at the event, they have not lost at the competition since they were beaten 5-2 by the United States in an opening round contest in Edmonton in 2012. 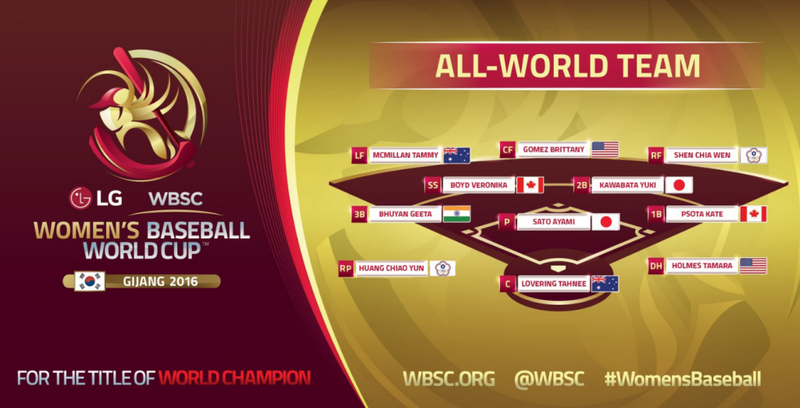 Pitcher Ayami Sato has been named in the WBSC's team of the tournament, alongside second base player Yuki Kawabata. Despite their heavy final defeat, Canada also have two players named - shortstop Veronika Boyd and first base Kate Psota. Australia, who were fifth in the super round to narrowly miss out on a semi-final berth, are represented by Tammy McMillan at left field and Tahnee Lovering at catcher. There are also two players from Chinese Taipei, although the team that beat them in the bronze medal match, Venezuela, are not featured. Right field player Wen Shen Chia and relief pitcher Yun Huang Chio are included for the Asian nation, and there are also two Americans despite their surprise early exit from the tournament in the group stage. Brittany Gomez is selected at centre field, with Tamara Holmes named as designated hitter. An Indian, Geeta Bhuyan, is picked at third base despite her team registering three heavy defeats.